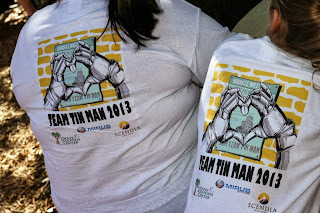 Tin Man at the 2013 Miracle Miles! The 2013 Miracle Miles was an unbelievable success! As a team we raised almost $9,000 for the NICU at Winnie Palmer Hospital. Taking into account that a donor matched all money raised for the race, Team Tin Man was responsible for almost $18,000 in donations this year. Throughout the day, we were greeted by several of the hospital's doctors who asked us to thank every one of you personally for making such a number possible. Thank you to everyone who walked, ran, and donated in the name of Team Tin Man, we are forever grateful for your support. This race has been, and will continue to be a rallying point for Holden's fight. Seeing so many people sacrifice their morning and (in some cases) bodies is amazing. Please mark your calendars for join us on February 8, 2013 for the Orlando Chili Cook-Off!